The lead-up to the big Guardians of the Galaxy movie resulted in a lot of cross-marketing efforts and tie-in deals. Or basically, anyone who had anything related to the Guardians was going to try their best to cash in on such items in time for the movie. In my case I finally picked up a copy of Avengers Assemble for similar reasons - it was on sale on comiXology around the time the movie came out. As much as it's an Avengers title, the first story arc featured in this comic heavily featured the Guardians as well. I kind of look at Marvel NOW! with a little less disdain compared to DC's New 52. I guess it has more to do with the effort to still respect past progress for Marvel NOW! affected titles as compared to the supposedly complete overhaul of New 52. And this was one of those bridge titles that tried to tie together the past and future versions of the Marvel Universe. And as much as I've always respected the Avengers as a superhero team, they've always felt a little out of their depth when it came to cosmic-level events. The Guardians on the other hand were pretty much formed under such conditions and would continually throw themselves into the fray of one interstellar conflict or another. 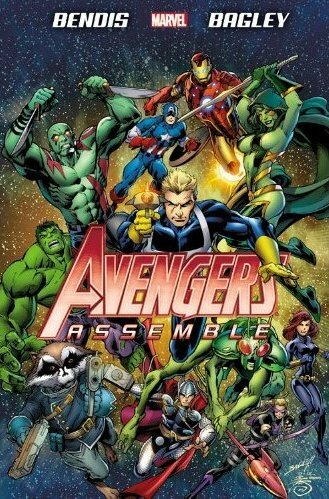 Synopsis: Avengers Assemble is superhero comic book series that debuted around the same time as the 2012 Avengers movie as an obvious jump-on point for fans of the cinematic universe. But the fact that the Guardians were included in this first arc sort of become more interesting in light of the recent Guardians of the Galaxy movie released this year. This first volume covers issued 1-8 with a story written by Brian Michael Bendis and art by Mark Bagley. The story begins with a new group of criminals known as the Zodiac performing various heists involving special items. The group seem to have tremendous powers based around the various figures of the Western Zodiac. But the focus of their interests aren't just ordinary pieces of technology. The were some of the most powerful artifacts known to be on Earth - including the Ultimate Nullifier. And the Avengers are barely able to hold their own against individual members of the Zodiac, what more when the 12 come together. Enter the Guardians of the Galaxy, who are also interested in the strange events on Earth. When items of cosmic significance like the Nullifier are being gathered up, you know that something big is up. And when that something big turns out to be someone - in his case the mad Titan, Thanos. And it'll take the combined efforts of both the Avengers and the Guardians to even begin to figure out how to deal with him. The comic nicely starts out with the Avengers struggling to stop the initial Zodiac heists and the powers of each Zodiac-inspired enemy were pretty interesting. Sure, it's hard to believe that a bunch of potentially average individuals given tremendous powers would immediately be able to stop highly experienced heroes like the Avengers right off the bat. But that's the core premise of the beginning of this story so we'll just go with it. And by the time that the Guardians come into the picture, we sort of just gloss over the events at the end of the Thanos Imperative that had Peter Quill trapped in the alternate reality known as the Cancerverse. No time for addressing continuity gaps! This might be a mystery that some other writer can explore! And the Guardians do their best when they're blinding charging into battle and hoping a better plan comes together as they go along. I didn't quite get why Thanos was setting his sights on Earth either. Again, we never address how he too managed to escape the Cancerverse. And then his objective on Earth seemed somewhat small time compared to his involvement in fairly recent cosmic events. After years of more or less being one of the "good guys" we have him back to petty dreams of hunting after alternative power sources to fuel his ambitions. I thought that we had established that Thanos was a more complex character than this. On the whole, Avengers Assemble is really a Avengers-focused title, and I can't fault the folks at Marvel for that. And while it's probably a good representation of what makes the Avengers the Avengers, Bendis didn't really know what to do with the likes of the Guardians and Thanos and just used them as so much window dressing. The Guardians smash and Thanos is just a big bad guy. Beyond that, their characterization felt a little thin in this adventure. Avengers Assemble did its job - it helped launch another Avengers title that movie fans could embrace easily enough. But I'm also glad that this didn't become some permanent effort to keep the Guardians on Earth or something - their own comic sort of did that for them. It gets 3 overpowered Zodiac villains out of a possible 5.